Since 1978, the Chilmark Road Race has been run along beautiful but oh-so-hilly Middle Road. Proceeds from the race are donated to the Town Affairs Council to assist in the operations of the Chilmark Community Center and make scholarships to year round residents possible. Please DO NOT call the Town of Chilmark regarding the race. Instead, please use the contact information below. REGISTRATION is ONLY ONLINE for the Road Race. Registration opens at 8am, July 1st. Registration is online only using your credit card. Entries are limited to 1600 runners. Please enter early! Pre-registration is required and fills up quickly. LAST YEAR REGISTRATION CLOSED ON JULY 12TH! The Road Race could not occur if it were not for the numerous volunteers who help with everything from parking to handing out water. If you are interested in volunteering for the Chilmark Road Race, call the Center at (508) 645-9484 in early August. All volunteers get a free shirt, on a first-come first-served basis! The Community Center would like to thank Hugh Weisman, the founder of the Chilmark Road Race, for the countless hours that he and his family dedicate annually to the organization of the Run-for-the-Lobster. 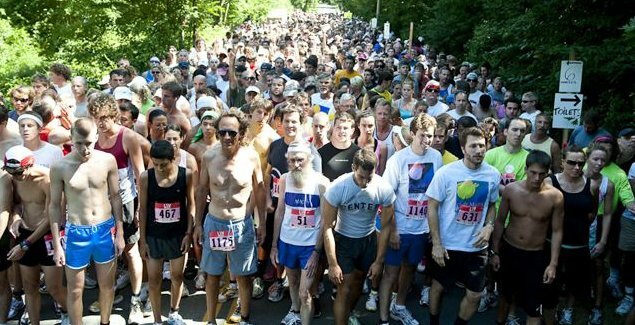 The Road Race is one of the highlights of every Chilmark summer and an important fund-raiser for the Center. A special thank you to the Chilmark General Store for your continued support of the CCC and your generous donations to the Chilmark Road Race! All runners must check in at the Chilmark Community Center either the Friday evening 5:00-7:00pm preceding the race or 8:30-9:30am Saturday morning of the race. Numbers, timing chips, t-shirts, and race instructions will be issued. If you check in later, you may miss the race, as we must bus you to the Start. Buses start rolling at 9:00am and you must be in line by 9:45am. Parking is limited, so please arrive early, carpool or, better yet, leave the car at home and walk, ride a bike or ride the bus. The finish area (from which runners are shuttled to the start area) is located at the Chilmark Community Center served by VTA routes 4, 5 & 12. There will also be parking at the Chilmark Dump with a shuttle to the Start…for those who have already checked-in only. In addition to fixed route busses, special buses will provide transportation from Vineyard Haven to Chilmark for runners arriving in Vineyard Haven at 9:00am on the 8:15AM Steamship Authority ferry from Woods Hole. Buses will return to ferry after the race. Double strollers, skates, dogs and other animals, ostriches, scooters, and skateboards are prohibited. Single strollers are strongly discouraged. If you must run with a stroller, exercise extreme caution. Souvenir t-shirts are given to all entrants. Tanks, sweats, and specialty items will be on sale at check-in. The Start is 3.1 miles east of the Chilmark Town Hall on Middle Road. It’s very hilly from 1.5 to 2.6 miles. The Finish Line is at Beetlebung Corner next to the Town Hall. Please contact us at info@chilmarkcommunitycenter.org to learn more about how your company can sponsor the Chilmark Road Race.